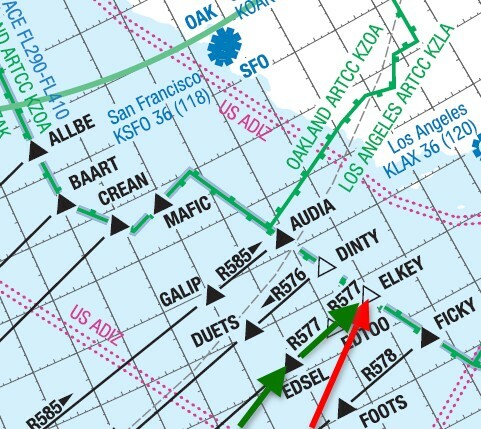 … where EKLEY is the end of the Oceanic area and LAX is of course the VOR at Los Angeles airport. The problem comes about as I commence my customary preparation for the arrival, which includes selecting a STAR (Standard Terminal Arrival), Approach and Runway. This changes the route and sets off an alarm with Oakland Oceanic Control. An automated system advises the relevant controller that my FMC no longer matches our notified flight plan and eventually this results in a warning message to me on board the aircraft. It’s difficult negotiating/explaining the situation over a CPDLC link – and so essentially I return the FMC back to match the flight plan. I prepared everything else I could for the arrival – Weather/NOTAM review, Charts, Briefing and the rest of the aircraft setup. Then once we were cleared out of Oceanic airspace – about 15 minutes before top of descent – I entered the arrival details into the FMC, had the PM cross check it and down we went. The first time this occurred I didn’t think about it very much, but the second time I saw it was as a Check Captain sitting in the back seat, watching the primary crew prepare for the arrival. Essentially the same thing happened, except the crew delayed all arrival preparation activity until the could enter the arrival into the FMC. This meant that the briefing didn’t start until descent was well commenced and the whole thing was a bit of a shambles. So I called Oakland Oceanic and spoke to the senior controller, who explained what was happening, and what had change to bring it about. As it turns out, after a number of position reporting errors, Oakland Ocenic activated the alerting system that was now causing us problems. 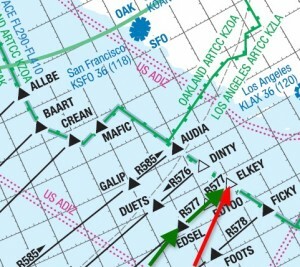 Essentially every 12 minutes (or so) the aircraft reports position via CPDLC to San Franciso Oceanic. This report consists of current position, estimate for the next position, and the name of the following waypoint. Thus on the several hundred mile run into ELKEY – it was reporting estimates for ELKEY and that the following position was LAX, which matched out Flight Plan. But as soon as we changed the FMC to reflect the fact that we weren’t going directly over the top of KLAX airport to the LAX VOR, the automated system still generates an alarm that our FMC doesn’t match the Flight Plan. And so on it goes. Thus all position reporting right up to EDSEL would not reveal any changes to the flight plan after ELKEY. By the time you get to EDSEL and the problem is likely to occur, you’re cleared out of Oceanic Airspace, talking to SOCAL (Southern California Control) and the anomaly is moot. I advised my company of this in April. In the meantime there are several options that can be considered to get around this problem. Our FMC’s incorporate a Route 2 facility.Thus you can build an arrival, approach and runway in Route 2 , then activate it later on when cleared. This allows the crew to setup and brief and prepare for the approach – even check the route in the FMC – without interfering with the active flight plan. You can’t predict fuel/time with Route 2. Thus until we have a clearance, we would not have an accurate idea of fuel/time/top of descent planning until STAR clearance received and Route 2 activated. We tend to arrive in LAX with bags of fuel anyway (at least until we improve our EDTO limit) but it’s still not ideal. When reviewing Route 2 you can’t get time/altitude predictions which means if you want to evaluate what altitude/speed an aircraft will be transiting a waypoint, you can’t. This is a technique crew can put to good use. In particular you can delete a hard constraint of the active route – without executing – and see what speed/alt the FMC would want to fly you through at that point, thus gaining pre-situational awareness on whether the STAR will have you high or low at that point; whether the constraint will be binding on the descent path; etc. You can’t do this with Route 2. I personally would have concerns about flying a route that won’t be checked after it has been activated. To be honest I can’t yet articulate what my concerns are on this one – but loading Route 2 well ahead of time, then receiving a clearance, then activating and executing route 2 sometime later and flying it potentially without the time to check it thoroughly – that worries me. If we start running around on Route 2 we are going to have a small set of senior captains (not pointing to any particular Asian airline here, or ex French aircraft drivers) who are going to insist on route copying and re-activating so Route 1 is the active route all the time, and I will be forced to mock them which is not good for morale. This practice will hamper the more useful technique of planning the diversion in route 2 during times of bad weather at destination. This planning would need to take place after the clearance is received, at about the same time as the arrival briefing, with is a busy time. Diversion Alternate planning is a better use for Route 2 than as a work around for an ATC shortcoming. If we go down the Route 2 route (sorry) ATC wins. Bugger that. Route 2 is a viable short term fallback option – certainly better than doing nothing at all – but the simple solution is to plan via the paired oceanic exit points. I haven’t see any progress on this issue since my initial investigation and report in April. On my last flight to LAX, I had an arrival established in the FMC when I went off to last rest. When I came back, it had all been deleted. I asked the Sen FO – someone very experienced and capable (one does not necessarily imply the other …) – what happened to my arrival? Essentially while ATC had not detected the discrepancy, it turns out that my cunning plan to fool ATC and leave ELKEY-LAX (route discontinuity) – FICKY / STAR / Approach / Runway – screwed up the arrival time shown on the in flight entertainment system, and the passengers start to worry about their connections, so my careful preparations were abandoned. Once again. Back to the drawing board. Or at least Route 2 for the time being.